The Church of Scientology is fighting for its life in the Garcia v. Flag et. al. lawsuit. Garcia is alleging commercial fraud on the part of the Church of Scientology. If Garcia wins, the floodgates to other lawsuits against the Church of Scientology for commercial fraud are flung wide open. The instances of Scientology and its front groups lying in order to raise money are legion, e.g. Narconon has more than 27 lawsuits against it for allegations related to lying to families of drug addicts about the type and efficacy of treatment services offered by Narconon. Former Scientology “second in command” Mark “Marty” Rathbun has been called as a key witness by Garcia. Scientology attorney Bert Deixler deposed Rathbun. Tony Ortega posted more video of the deposition at his blog today. We post Tony’s YT video below. In this video, Scientology attorney Deixler attempts to use a letter Rathbun wrote to David Miscavige in 1993 to impeach Rathbun’s credibility. However, the problem in doing so is that Rathbun opens up a Pandora’s Box concerning the Church of Scientology wholesale violations of the priest-penitent privilege; Founder L. Ron Hubbard; Scientology’s notorious Fair Game policy; and the 1993 tax exemption the IRS granted Scientology. Deixler pushing Rathbun to read the internal “Liability Formula” Rathbun wrote in 1993 — which document is allegedly priest-penitent in nature — is proof that the Church uses privileged ecclesiastical folders against former members. This is inherently Fair Game and an egregious violation of what the David Miscavige, Mark Rathbun, Monique Yingling, and other CSI lawyers told the IRS in support of gain tax exemption. Deixler leads with his chin in this deposition and allows Rathbun to state on the record that Scientology’s vicious Fair Game policy was never cancelled. By introducing Rathbun’s 1993 “Liability Formula” into the record, Deixler also hands Church critics further evidence that the Church uses private “ecclesiastical confessions” against former members. This is an egregious violation of the priest-penitent privilege. How did Deixler get a copy of a private confession Rathbun wrote to Miscavige? In my opinion, the letter had to have come directly from Miscavige via the Church of Scientology’s notorious Office of Special Affairs (OSA). I say this because Miscavige would have had to instruct OSA to deliver this confessional letter to Deixler. Moreover, this private letter would have been in Rathbun’s CSI-owned “pc folder” thus showing Miscavige’s complete control over CSI and OSA Legal. Finally, in attempting to establish a foundation, Deixler allows Rathbun to discuss tax exemption thus opening the door to this question: If what Mark Rathbun said in his 1993 Liability Formula was untrue, then was what Mark Rathbun told the IRS in pursuit of tax exemption also untrue? Rathbun was an indispensable and central figure in Scientology obtaining tax exemption. Deixler’s attempt to impeach Rathbun goes to impeaching the truthfulness of the Church’s tax exemption as well — and this could become a matter for a Grand Jury or DOJ probe. Deixler and Miscavige can’t have it only one way: Attacking Rathbun is attacking tax exemption is attacking Miscavige. The Church of Scientology: One big ball of wax. Liability Condition write-ups are not subject to priest-penitent privileges as the individual is making the document available for consideration to concerned parties seeking approval by signature for acceptance of its contents. I beg to differ. As presented by the Church of Scientology, a Liability Formula is a religious confessional made in the context of an ecclesiastical Ethics handling. The write up goes in a person’s Ethics folder, which folder along the pc folder, constitutes part of the pc’s Confidential Religious Files. These files enjoy legal priest-penitent protection. As part of Rathbun’s Ethics cycle, his liability formula would have only been read by his seniors and RTC, i.e. a very specific group of fellow Church members. Rathbun’s write up was never intended for public dissemination. Furthermore, any “Liability Formula” is owned by CSI in perpetuity. CSI represented to the IRS that pc folder data is vouchsafed within a person’s pc folders and is made available only to those ecclesiastical officials with a need to know. The question, then, becomes this: How does a non-Scientology attorney come into possession of a sacrosanct “ecclesiastically protected” liability formula write up? By what right or privilege does Deixler cause part of Rathbun’s document to be read into the court record by Rathbun himself? This is so wrong on so many levels. Indeed, point 5b of the CSI contract below even states that any disclosure of confidential files would be damaging to a person in this lifetime and in future lifetimes. Hence, by its own contract terms, CSI is acting with both premeditation and malice to harm Mark Rathbun. According to Scientology’s own contractual language, Rathbun’s Liability Formula write up would not be comprehensible to anyone lacking the requisite Scientology training to make such files comprehensible. Deixler is not a Scientology Ethics Officer, and, the Church of Scientology has violated its own representations of privacy regarding Confidential Religious Files. 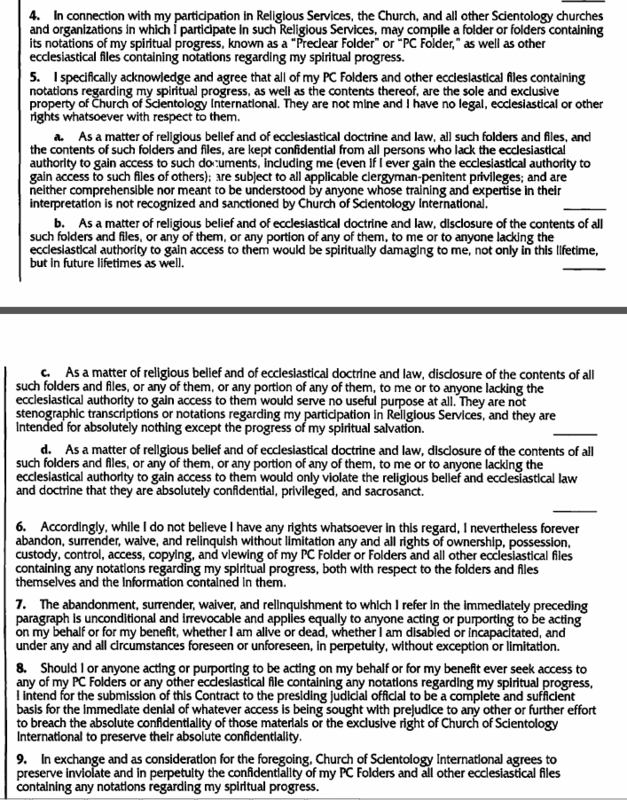 According to Scientology’s own contract, Judge Whittemore should refuse to allow Deixler and the Church to introduce any Confidential Religious File into evidence. Who is in the USA and in contact with the IRS? Formost – That may be true, but I NEVER in all my life in Scientology dreamed that anything from my ethics folder would EVER be used against me in the public domain. What happened to “all your sins are forgiven” and the general amnesties – the last of which was granted just after 9/11 (and Marty was not yet declared when that occurred so that amnesty covered him too)? Whether from an Ethics folder or PC folder it doesn’t matter – that is an internal and confidential document, and the ecclesiastical confidentiality applies. This is proof positive that fair-game exists! “Anything you say or do can and WILL be used against you in a court of law” – Sound familiar? Fantastic summation and article, Jeff. Thank-you. I am horrified at the Church’s tactics. This needs to go viral. That the Church would pull out a liability formula into the public domain in an attempt to “discredit” anyone is proof positive that fair game exists. They have sent the message out far and wide: NOTHING you have ever disclosed – either in session or at the MAA etc – is confidential, and we CAN and WILL use it against you. Despicable. I hope your legal reasoning can be adopted by the Attorney General’s office so that justice can finally come for those who have been tricked, lied to, and destroyed by the Church of Scientology.